It’s Cozy, but is it Safe? 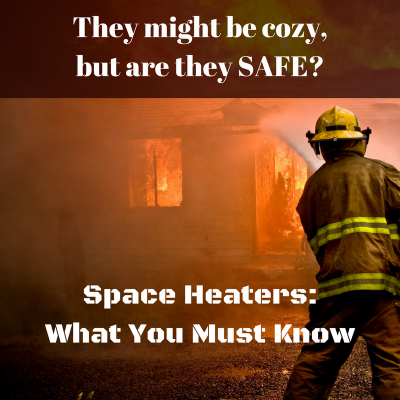 Space heaters can certainly warm up frosty toes or a chilly basement office while keeping the overall temperature of your home at a modest, budget-friendly temperature but these little heat-exuding appliances can be deadly if not used properly. To keep you safe, let’s just recap some numbers listed by the NFPA (National Fire Protection Agency) so you understand just why we want you to pay attention. There are several types of space heaters and almost half of the fires involve electric space heaters so please use common sense. To keep you and your family safe, read the instructions and follow manufacturer’s guidelines on any space heater you own. You can download the Portable Heater Safety checklist issued by the NFPA.